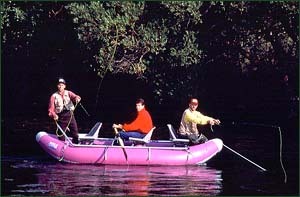 If you are in Aspen guided fishing trips can take the form of a float trip? There are a number of reasons. First unless you are from an area with big rivers, you may never have had the opportunity to take a Roaring Fork float trip. You will cover a lot of big trout in a single day. You owe it to yourself to try it! It is a great way to see the river. We have at least 60 miles of good floatable water within an hour of the shop. Basalt and Aspen guided fly fishing trips do have certain limitations during the busy time of the year. First, the public fishing pressure particularly on the Frying Pan is going to make the fishing more technical and congested. A Roaring Fork Float trip is a perfect way to get away from the crowds. In addition, at the height of the season, one can spend a lot of time driving around trying to find an untrafficked spot, whereas in the boat you can float at your leisure. There is a lot of private ownership of the Roaring Fork which limits wading access to the river. However, it is perfectly legal to float navigable water over private land provided you don't anchor. There are a number of access points to the river so a good guide will know where to get you into the water without having to wait in line to launch the boat. Discuss this with your guide for your Roaring Fork float trip at the beginning of the day so that you can get onto the water and get great trout fishing. Finally, one of the great attractions of floating is the scenery. One gets to take a nature ride down the river far from the madding crowd. In fact if your partner is not so keen on fishing, take along a book and a camera, a sun hat and sun-block and enjoy the view. There is room in the boat for two so couples can enjoy the day even though only one likes to fish. We do not float the Frying Pan River. It is too shallow. If there was enough water released from the dam to enable one to float, it would wash out the fishing for a time. We specialize in Roaring Fork float trips for trout as well as Colorado River float trips in spring and later in the season when the water is best and the trout are strong. The obvious advantage of a Roaring Fork float trip over a wade trip is that one covers a lot more water in the course of a day and therefore cover a lot more trout. You can float in either a raft or a hard boat. The raft allows for a gentler ride as it doesn’t lurch into rocks the way that the hard boat does. Furthermore, as the raft draws less water, it enables one to access water which would render the hard boat a difficult ride. We don't float hard boats for very long from Basalt because the water does not stay high enough for long enough. On the other hand, there is no point in floating at the height of the run-off. The quality of the ride would diminish the fishing experience. Floating is both for the novice and the experienced fisherman. If you have not floated before let the guide know. It is important, because in some areas, floating requires quick responsive and accurate casting. Furthermore, if you are not thoroughly proficient in handling your equipment, in faster water, you will lose time and miss good water while re-rigging or changing your fly. It might be more difficult for the guide as well if he is fully engaged in controlling the craft and you want him to re-rig your rod. In that case, a gentler water will give you the time and the guide the chance to make sure your equipment is rigged and working perfectly. Another consideration at the height of the season will be to find out how much traffic is on the river. The Roaring Fork is not a big river and therefore when boats pass, they are close to each other. You might prefer to float up higher in a raft than join a line-up at the launch. On the other hand, you might prefer to travel further down valley and get to less crowded water. 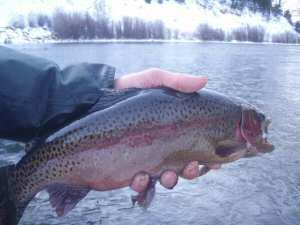 The bigger trout are generally on the Colorado so the conditions might dictate fishing there. There are however less fish down there. It is something you should discuss with the shop and the guide to ensure that we are able to give you the best possible experience. We also suggest that if you would like to consider a Roaring Fork float trip and/or a Colorado float trip call and talk to our shop generally and get advice on the best time of the year if your itinerary is flexible enough. When you float, you can wear waders so that you can stop and wade if the opportunity presents itself. However, particularly in summer when it gets hot, you may prefer shorts or lightweight gear with sandals or other light footwear which will facilitate wading but at the same time keep you cool. However, on hot days, it will get very warm in waders. So discuss this with your guide. Some guides happily wade in shorts where the water is not so cold. Another thing to note, when floating it is better to use a slightly heavier rod. This will increase your ability to control the trout, land it and get fishing again. If you hook a decent trout in fast water with a three weight, it will take you too long to land it. In addition it is also not good for the trout. On the other hand a five or six weight will give you the extra control you need. Furthermore, lower down in the bigger water you might want the bigger rod to assist in casting. At certain times the wind will come up and you won't want to be caught 8 feet short of a large rising trout. The other thing to note about floating is rod breakages. For whatever reason rods tend to get broken in a boat more than wading. A sudden lurch of the craft, overbalancing onto the rod and hey presto, you are trying to see if that lifetime guarantee is really as advertised. So maybe you would prefer to use the guides rod if this is a worry to you. Our goal is to ensure that whatever your requirements we aim to give you the best day out. You might like a lot of average sized fish, or you might prefer fewer larger trout. Ed loves to chase carp. They are a lot more difficult than trout and present a serious challenge to any fishermen. If you want to get out of your comfort zone, there is some seriously good carp fishing on the Colorado. You might just want to enjoy the beauty of a ride on the river and catch a few fish to top off the day. Bottom line. Discuss your requirements with the shop and with your guide. We would love the opportunity to exceed your expectations. We can go where others can't. The beauty of a raft trip is that drawing minimal water, it permits greater access on a Roaring Fork float trip which are higher up towards Aspen. Boats will not travel well in the skinny water.